Brownies, who doesn’t love brownies (the correct answer is no one)? Even if you’re not a big cake person, there is just something about delicious, fudgy brownies. Now try that with a delicious compote and some allspice (aka flavour of fall and the holidays – the spice in pumpkin spice), all while paired with a beer. Yup, that’s what we thought. So when Big Rock Brewery came to us asking for something to pair with their smooth Midnight Rhapsody Dark Ale with Fruit, this is the first thing we thought of. A dark beer that isn’t too dark or heavy, it has deliciously smooth notes of cocoa with hints of cherry, raspberries and black currents. 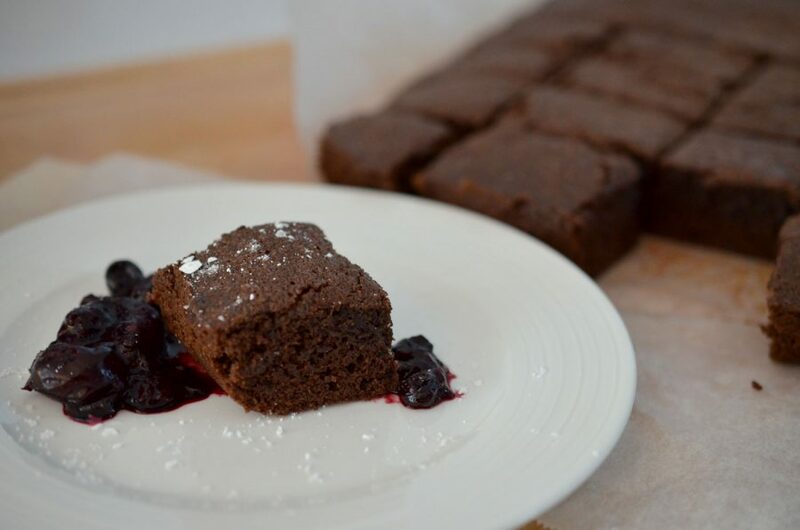 It plays perfectly with the brownie and compote and the spice just added that little something extra. Mix together the melted butter, sugar and cocoa. Beat in the eggs one at a time until the mixture is smooth. Mix in the flour until fully incorporated. Pour into a grease or parchment-lined pan 9×13 inch pan. Evenly distribute the batter in the pan and bake for about 25-35 mins or until a toothpick inserted into the center of the brownies comes out clean. Set aside to cool. Meanwhile, prepare the compote. Combine the berries, water and allspice in a medium side pot and simmer on the stove for 10 minutes or until the berries begin to breakdown. Set aside. To cut the brownies, lift all edges of the parchment paper up from the baking pan until the brownies release from the bottom. Place on a cutting board to cut. If using a greased pan, cut the brownies in the pan. Gently run a knife around the edges of the pan to release the brownies. Slowly pry one piece out a time with a knife to remove from the pan. Serve plated with 2 tbs of compote per brownie and a cold Big Rock Midnight Rhapsody.